goes ever on and on ..."
Last week's article on "Fun Doesn't Mean Easy" pulled a long response from a player in an old school* game. The writer agreed with some of my points and disagreed with others. Reading it triggered a few thoughts that are worth setting down in writing. The crux of the matter as laid out by the player seems to revolve around whether D&D** is a game or a collaborative story. No one can answer that question definitively. It's both, of course, but we play it for different reasons at different times and with different people. 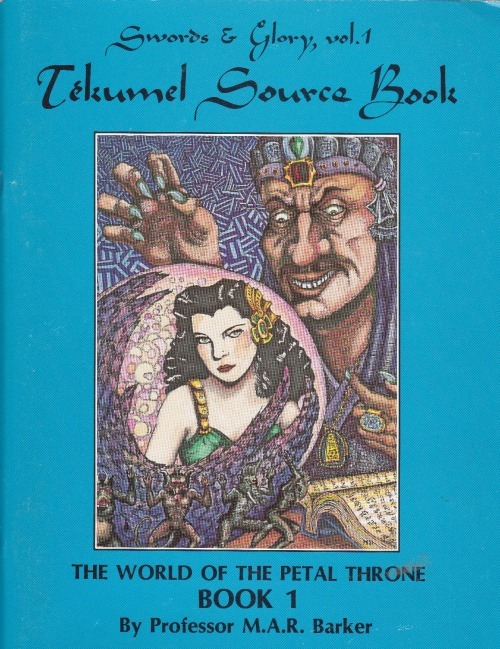 As more tactically rich RPGs came along, we experimented with them furiously: Runequest, The Fantasy Trip, Chivalry & Sorcery, DragonQuest, Swordbearer, Rolemaster. Each of them brought something to the table that D&D lacked, for tactically minded players like us. Eventually we always came back to D&D. Chiefly that was because when the group needed new players, D&D was the easiest draw; every person had a different first choice, but everyone could agree on D&D as their second choice. Through all of this, we identified with our characters primarily as extensions of ourselves. It wasn't Moleslayer the Gnome prowling those dungeon corridors; it was Steven Moleslayer in the guise of a gnome. Steve and Moleslayer were folded together in varying proportions, but there was never any doubt whose personality was in charge. As the '80s progressed, roleplaying evolved. Questing for gold was out of fashion; storytelling was in. Character development was the new hack'n'slash. I evolved along with it. Our game sessions moved away from precision raids to subtle character interaction, mood, and long, continuing plots influenced by events from the characters' lives that happened before the first adventure began. No more was it Steven Moleslayer stealing into the drow enclave to seize the Ruby of Endless Red because it would make him rich, along the way cleverly avoiding many dangers and slaying many enemies lest he be slain by them. Now it was Moleslayer the Gnome stealing into the drow enclave to seize the Ruby of Endless Red because it had once belonged to his grandfather, who died beneath the blades of drow marauders rather than submit to slavery, and Moleslayer had inherited a fierce drive for payback from that giant among gnomes. Along the way he would encounter many fascinating characters with equally fascinating backstories. He would kill some, befriend others, perform favors, and be granted favors on the road to (almost inevitably) completing his life's epic quest. Both of those are valid modes for playing D&D. Only a fool would tell a person who likes one to the exclusion of the other that they're doing D&D wrong. But since--oh, let's say the turn of the century--I've been slowly drifting back toward where I began, until I now find myself nestled comfortably somewhere in the middle. D&D is about storytelling, but it's also a game, and I enjoy the gamey parts: solving puzzles, figuring odds, taking calculated risks, having done everything I can think of to minimize those risks but still knowing that failure is a possibility. Finally, I like creating my character's story via the choices he makes, the victories he wins, and the defeats he suffers during play, rather than letting events from the past steer the future. Partly that's because I'm gorged up to my esophagus on the unending diet of by-the-recipe characters with tortured pasts that we've been fed by modern fantasy novelists and Hollywood. More importantly, it's because D&D is a game and games need uncertainty. I don't know where The Moleslayer will wind up. Perhaps he'll pick up an epic quest along the road to adventure; perhaps not. If he does, it will be a high-risk venture with an uncertain outcome (or, as Gimli put it, "Certainty of death, small chance of success ... What are we waiting for?"). Either way, it will be a choice that he makes actively in light of current events and future expectations, not because of factors that were set in motion before his feet touched the road. Assuming you agree that D&D sits on a scale with "It's a game--let the chips fall where they may" on one end and "It's an epic story--the characters have a destiny to fulfill" on the other, where do you set the balance point? Or do you reject the premise? * I shudder a little every time I use the term "old school," because the more it gets used, the less it seems to mean. My friends and I played all sorts of games in every imaginable mode in the 1970s. The "old school" days were a time of wild experimentation with this new entertainment form called roleplaying. Even then, no one could agree on the one true definition for roleplaying game. ** Normally I try to broaden these discussions to RPGs as a whole, but D&D is so much the focus of the OSR that I'm sticking with it here. *** It's a great quote, despite being somewhat wrongheaded--a fact that von Clausewitz seems to have picked up on unfortunately late in life. There I go with wargaming again. I believe a balance can be struck, and I believe that my current group has struck that balance in our recent Castles & Crusades endeavors. Together we've definitely combined the best of storytelling and pure gaming. The players juggle plot threads with aplomb while simultaneously burying themselves in tactical considerations, both in and out of combat. I can't pinpoint specific moments because when we're striking that elusive balance, because in the moment of that goodness you're not aware of it...you're just living the dream! I'm really lucky, all in all, to have a great group! So many other RPG bloggers that I read lament their lack of a group. I'm countint my blessings all the time. So, I laugh at the poor self-deluded souls who think story has no place in "realy" D&D. They're all the poorer for that belief. I'll be happily doing the "impossible" and "playing the wrong way," and me and my players will keep having a great time. If what we're doing is wrong, I don't wanna be right! I think any game is going to benefit from a rich setting and well-drawn npcs with strong motivations. I balk at the point where the story has to be ABOUT the PCs, though. Creating an intricate backstory and motivations for your character is great, but once you sit down at the table, that character's "story" should be emergent, not predestined. For me, if I know there's no real chance of failure or death, what's the point? If you're just going to tell me a story about how epic and godlike my character is, why don't we just skip to the end and save some time? I like the distinction between a story the characters are participating in and a story that revolves around them. This is an absolutely crucial understanding of the way the game functions. Emergent story, at least to me, is as good or better than planned story. As you can tell from a recent recap and player's journals I don't run a game LACKING in story elements! However, the essential strength of D&D is the creation of a story that emerges organically from play; just as the strength of a novel and its essential power is to tell a story to the reader, D&D is more suited for one task than the other. Personally, I find the emergent story to be MUCH more rewarding, and I know my players do as well. I think one of the issues I have as a DM is when the players set themselves up for a game set on Story instead of Adventure then it leaves the DM in a position of never challanging the group too much for fear of character death or TPK. For me, if there is no threat of death, than whats the point- I might as well play a computer game where I can just hit the restart button (I dislike computer games, WoW in particular). I understand the players desire to create a character they feel attached to in some way so that character just isnt a nameless chess piece they are moving around my campaign board. But, if the character doesnt expect that his character may die when he puts himself in harms way, weather it be due to the roll of the die, bad decision making or whatever, then you really have a computer Avatar. The other thing I dislike is having to always provide answers and spoon feed the group as to how to handle the situation ( ex. To deal with encounter A, find item B and use it in location C) I mean it just feels like too much railroading. I think there needs to be a good combination of both. I think that if characters have some simple but interesting back story to play around with then dump them into your campaign and let their success and survival tell their story. In Old School ( up to AD&D 1) I think the character death rate was not only high , but also understood to be just part of the game. With AD&D2 ( and certainly 3rd edition and up) The characters became more the focus with elaborate back stories, elaborate class and race abilities, etc. Even Campaigns like Dragonlance ( which I liked) pretty much set up this model as the Characters being at the center of the Campaign. I run a Pathfinder group and its pretty much like this. The players and the rules take front seat over the campaign and after years of them complaining about my "TPK" style of play ( BTW im an easy DM- I just think they they just do stupid things), I was forced to create a "devise" that always raised their characters within 24 hrs if they died with really no penalties. I dont like, this, but in a Player/Character driven game, it was the only way to keep their "story" going and keep them from constantly complaining or dropping out of my games. A good question. I think I'll add it to my list of potential topics, in case any flashes of insight come to me. One thing that works beautifully if you wish to maintain an overarching story or party continuity is the Fate Point mechanic of Warhammer Fantasy Roleplay (1st Edition). In WFRP, Fate Points are not another resource to be managed by the players but instead a strictly limited number of overt DM interventions to save a character's bacon by fiat. They have the advantage of being transparent and effective. Best of all, it's exceedingly unlikely that all PCs run out of Fate Points at the same time, so as a DM, you need not worry about TPKs. You can hit the party as hard as you like -- there'll always be some survivors to carry on. Yes I gave the party those as well. I call them Hero Points. They allow the characters to use them to add a point here or there to a roll in their favor. But some of course balked at not being given enough of them during the game ( wow never satisfied). Mazes and Minotaurs uses a similar system that allows the characters to call upon fate- but it can be adding +20 to a roll, killing a vast amount of enemies at one time, getting some insight from the GM about a particular course of action,or saving one from death. I may incorporate this as well. But being that Im very generous with healing ( clerics can swap out any spells for a cure instantly, heal 1d3 hp after each battle, if you go below zero, make a save or die or you regain conciousness with 1 hp, healing salves, etc). Not to mention that I have also given in to the players claims that first level HP arent enough to survive- so now everyone gets an additional 1d6 hp to add to their already Maxed out first level HP. When you start to add things like this, again and again, you start to wonder why I just dont have a Restart button like a computer game and let you pretend like nothing ever bad happened. Tom, I really feel for you. It sounds as though your players have totally run roughshod over you. Though I fear sounding too much like Dear Abby by doing this, I do have some suggestions that might help you take your players back to the old school feel that you yourself are missing. Here's one suggestion: have everyone start as a level 0 character. No class, just a hit die based on profession. Let them use their wits instead of their THAC0 and massive hp pools to overcome problems. They'll feel much more vulnerable, and as a consequence the victories they win will be that much more palpable. If that doesn't shock them into it, I have some other ideas up my sleeve. But I would let them go through an entire little introductory adventure (never earning xp, mind you, as they are level zero) and then allow them to turn up as level 1 in the class that makes sense for them at the end. For example, you could have a blacksmith or farmer's son play a proto-fighter (d10 hp), a wizard's apprentice who's only spell is cantrip (d4 hp), and a local merchant's son who likes to creep around at night to visit the ladies (d6 hp). These would clearly become a level 1 fighter, wizard, and thief at the end of the opening adventure. Dungeon Crawl Classics starts each player with several 0 level nobodies, and the goal of the first adventure is to find out which will live. They call it the 'funnel' and having several to choose simultaneously may make it more palatable than having to shepherd one at a time. I've got another idea for you Tom; every single modification that you have put in the game rules to help the players out start applying to the monsters as well. That will completely balance your game. Example: fate points. The orc chief has them, too. Probably 3 of them. A dragon might have 8. Example: an extra d6 hitpoints at first level? Every monster has an extra d6 hitpoints. Example: healing spells and d3 extra after battles; enemy clerics can switch out the spells memorised for anything they want (hint: hold person) and can use their d3 bonus as a reverse extra d3 damage. When the players complain about this... remove the mechanic from the game /entirely/. It just wasn't working like it was supposed to. And what applies to the players MUST apply to the monsters or they are simply cheating, you can explain to them. ha..I've seen that one in action. "I rolled a 20...why don't I get to roll on a critical hits chart?" "okay. The monsters will roll on the same chart." @ The Iron Goat: I use the Combat and Tactics critical charts for PCs and all NPCs. More than one PC or beloved NPC has had terrible disfigurements visited on them as a result! For me and mine, roleplaying has always been paramount in D&D, but I wouldn't call our games collaborative story telling. To me, storytelling implies that each character has some sort of predefined role to play in the grand scheme of things. We were simulation gamers before we ever heard the term, but we were trying to simulate high fantasy, all of us being huge LotR fans. The end result was that if you made a mistake or mistep, you would end up in the deadbook, but there were times when a player would sacrifice himself covering a retreat for the rest of the party, or the paladin would refuse underhanded tactics. These produced really powerful moments in the game that would affect the rest of the campaign. TL;DR - Tactics were of some import to our D&D, roleplaying was moreso. We weren't so high-minded to call it storytelling. The way you describe your early games is the style of play I prefer. In my groups we usually focus on problem-solving over story. While I agree that D&D says it sets itself up to allow your characters to be like those presented in fantasy literature, the reality is, that is not how the game is designed and nor implimented. From a mechanics point of view, in order for your characters to be at the heroic level of such figures as Legolis or Conan or the Grey Mouser, they would have to start out at substantially higher level. Also, keep in mind, that they are characters of fantasy literature, it doesnt do the author any good to have them traipsing around dungeons and getting killed by goblins in the first book . Also D&D has evolved over the years and its style of play differs between editions as much as it does DMs/Players. I think constantly focusing on the " story", when the "story" is really what you guys make it to be. I dont have any over arching plot here, I have a bunch of adventures Ive strung along and you each have provided me with personal "elements" to work into those adventures to give your characters a reason to be exploring in the area. I think thats great, but everything in the game is not designed around your characters, its either designed around the setting or the the adventures itself ( however realistic or un realistic it may seem). In your example of the canyon, I see the canyon as just there. Now I may want to put a bridge there, a bridge with dangers or no bridge at all and see - how do the characters get across-or what if perhaps you are under a time constraint. Does the group try to come up with something to get around the obstacle or do they just give up. Do they think about finding a spell caster to make fly potions or fly scrolls for them to get across, or do they try to investigate another way around, or what. This is part of the search, explore, problem solveing, time management of the game. And as a group the idea is to know maybe when you should keep trying to work at something, and when you should walk ( or run) away and leave it for another time. Now I certainly can run a mini campaign for the group, but with little or no guarantee various players ability to show up each session or continue playing long term, it makes this kind of campaign setting difficult to run or rely on., ( I know because my Mazes and Minotaurs game pretty much died due to players constantly not showing up or quitting and someone haveing to run their characters or me having to rewrite the story to accomidate their absense. They were suppose to be heros sent on a mission from the gods, hard to do when half the heros dont bother to show up). That's an excellent response. And it's nice to hear Mazes & Minotaurs getting some love. I've never played it, but I'm a big admirer. Yes Mazes and Minotaurs is an Awesome game especially if your trying to get out of the traditional "Tolkein" style of setting and get into something thats fantasy but recogniseable. I really had fun running it and would love to do it again if I can get a group to devote to it. As I said, its hard to run an Odyssey campaign, when the major Heros ( the players) keep dropping out or not showing up. There is a link to M&M on my site if you want to take a look and download the game and suppliments. I think they did an Amazing job. There's a great thing about interesting dungeon sites and hex crawls vis a vis story gaming. Sure, you may go into it without character backgrounds and story-based motivations, but the process of playing the game and surviving various challenges (or not) creates these amazing experiences and memories. It's really story as memoir, and is more like how we retroactively stamp stories on our day-to-day life (backwards looking) than the forwards-looking stories that get crafted in fiction. Actually, I play it much like a swords & sorcery game in the sense that the characters are there for glory and fortune. Whether they actually grab a position of power, much like Conan, is up to them to go for it (in other workds, start doing that in game) and to me, as a DM, to provide it for them with as much obstacles as possible in between. After all, even Hercules or Ulysses had to surmount impossible odds. On this level, I play it much more like a game of exploration, where the characters delve into dungeons and lost ruins, tempered with their return to civilization. Is there a story behind all of this? Yes, the plot that we make as we do all these things, the story that grows from what we've done so far, not from what happened BEFORE the campaign started or the one I'm planning to do. I let things roll gradually. I agree with Beedo: it's during the process of playing the game and surviving challenges that we create the most fond memories of our game. Firstoff, great post. I've loved your blog ever since I first found it (through twitter) and followed it instantly (on blogger). I've actually enjoyed both play-styles (like yourself) very much at different points in my long gaming career. What I don't like (similar to yourself) are the people who keep trying to argue that D&D is 'only' a game or 'only' a combat simulation. I write novels, so I have to say I really love the 'role-playing' side of the game. Really, role-playing and story are what separate D&D from all other games (and video games). If we lose the story/role-playing we lose D&D (I think). I'm currently in a "Role-playing" phase but there are times when all I want to do is wade into the dungeon and whack a lot of monsters to get treasure. I don't really care what the story is, I just want to have fun and not worry that much. However, my 'combat crazed' phases tend to wear out faster. This is because all the fighting tends to get competitive and eventually you get to the point of thinking 'why am I even bothering? I could just kill stuff on the computer instead'. It's always at this point where I have some great idea for a change and throw role-playing back into the 'story' of the game. So, to sum up. I think both have a place in D&D and should probably be in balance. If the scale must tip, I think it should tip towards story: it's what makes D&D D&D and not a computer game/miniatures game/card game. Really, D&D inspired a lot of these things; why should it emulate them? I know I'm treading on dangerous turf here, but I think 4e went too far to the 'combat' side of things (I like 4e!). I'm hoping 5e will tip back in favor of story-telling, or at least give it at least 50% attention in the rule books/content. I just 'love' the stories D&D can create. It's the epic tales of your heroes you remember long into your future, not what you rolled to kill a dragon. I still have happy memories of exploring from way, way back. The fights weren't quite as memorable. It was the camaraderie, the sense of place, the adventure, the exploration, the characters, and the 'sense' of story in general. Kind of like a good book. D&D actually got me started in writing and I love writing. If there's one thing I like better than gaming, it's writing. However, I owe the 'game' aspect my start in writing because it encouraged my earliest writings (adventure notes) and reading (rule-books for a great game). I just grabbed a copy of Challenger and the adventure pack. Looking forward to reading through it. Thanks so much Mr. Winter! That's totally awesome and a major honor. Thank you. I'm currently revising the book and adding in loads of art and formatting for the print version. I've had some great feedback so hopefully the new version will be much improved. Thanks again. I really appreciate it. Keep up the awesome work on the blog!